When we started Two Blue Passports, our number one goal was to inspire others to travel. We were complete amateurs and neither of us even owned a camera! After our first few blog posts, we quickly realized that in order to successfully inspire travel, we needed more than just iPhone photos to bring our itineraries to life. Travel photography is such an incredible way to document your adventures, share them with family and friends, and inspire others to get out and see the world. That’s why in this post, we’ve enlisted our friend, Charlie, from World of Travel Photography to share his top beginner tips to travel photography. Check out his recommendations below. We hope it helps you step up your travel photography game and don’t blame us if you start to chase sunrises and sunsets on your adventures! Hi, I’m Charlie from The World of Travel Photography. I’m a travel photographer and have been traveling the world for the last few years doing what I love. At the moment, I’m based in Spain and enjoying having Europe at my doorstep to explore. On my blog, you’ll find all of the information and inspiration you need to get out there and explore the world. In this post, I'm sharing the top 3 tips to help you take the perfect pictures while you travel. The first step to taking the perfect shot is to plan ahead for what you want to see on your trip. That often means doing a bit of research before your trip to get a better sense of what types of photographs you may want to take. Start by searching the locations you're visiting on Google Images and get a sense of what sites and scenery you'll see. You can also search the destinations on Flickr. You’ll get a lot of inspiration of places to shoot - just be careful not to copy what other photographers have already done. Use Flickr as a virtual location scouting tool and then decide how you'll shoot the locations using your own style. I found out about this eerie abandoned train covered in graffiti in the middle of a forrest, miles from the nearest train track, and had to see it for myself. Pick a subject as your main focal point in the frame and make all of the other elements in the photo compliment it. To do this, you'll need to make use of ‘leading lines’ and an "anchor". Using leading lines is a technique that can direct a viewer's eye to the subject of the photo. An anchor is picking a subject in the foreground to add context to a photo. Take this photo below as an example. The focal point and goal of taking this photo was to capture the sunset over the mountains of Barcelona. However, the house in the foreground acts as both an anchor and as a leading line in this case. As an anchor, it secures the viewer’s line of sight and from there gives the photo a certain degree of depth and perspective. It helps the viewer feel as though they are looking at the scene from that position in the photo. It also helps when it comes to judging the distance between objects in the frame giving it more depth instead of it being just a ‘flat’ scene. As a leading line, it naturally draws the eye from the anchor (itself) to the main focus of the image, which in this case is the sunset over the mountains in the distance. The roof of the house forms an upside down ‘V’ shape and it’s this line on the roof that is pointing towards where I ultimately want the viewers eye to be lead to. Leading lines and anchors don't have to be the same element like in the photo above. They can also be different. Simply put, a leading line is is a natural line in the surroundings and an anchor could be any object in your photo such as a person, bicycle, a rock, etc. The rocks in this photo are another example of a good anchor. 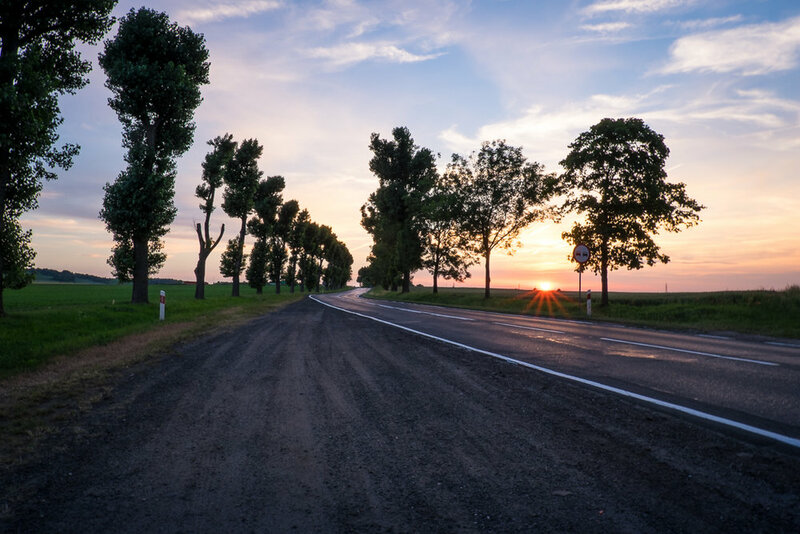 The road in this photo of the Polish countryside is working as a leading line by drawing your eye into the image and towards the setting sun. It’s not always possible to get both a good anchor and a good leading line into your image, but you should at the very least try to incorporate one complementing element in each photo you take. In order to take quality pictures, you need a quality camera. I recommend a mirrorless camera for travel photography. A mirrorless camera has no mirror (hence its name) that flaps up and down when you take a photo, unlike a traditional DSLR, the giant ‘professional’ looking cameras you’ll often see. The lack of a mirror system makes mirrorless cameras a lot smaller and lighter than conventional DSLRs, which makes them great for traveling. Unless you’re comparing them to the very latest high-spec DSLR cameras found in professional studios, then no one will be able to tell any difference. The quality of modern mirrorless cameras is incredible and it's what I use to take all of my travel photography. The next thing you need is a good tripod. A tripod is useful for shooting in low light situations because it allows you to have a slower shutter speed without ending up with a blurry image from camera shake. It’s also going to allow you to get some amazing long exposure shots. 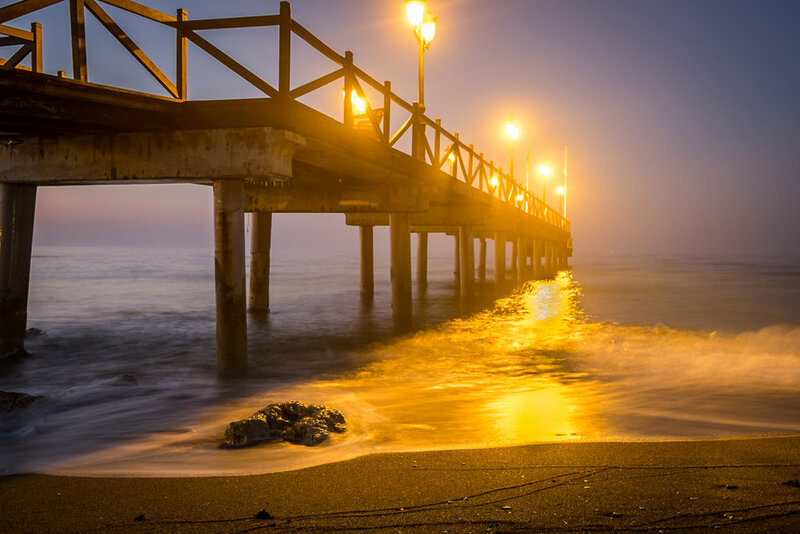 These are the shots that make the moving elements of your photo blurry whilst keeping everything else pin sharp, just like in this photo I took in Southern Spain at the beach one morning. Check out my recommendations below. You can shop right from this post! Thanks for reading! If any of these tips helped you out I’d love to hear about it in the comments below! You can also find me on Instagram, Twitter and World of Travel Photography.